THE number of tractors in Nawa, a small town on the banks of Sambhar Lake in Rajasthan, falls a little short of the number of people living here. Even the sweltering heat of April does not deter the 10,000-odd tractors, mostly Ferguson-Masseys, from ferrying unrefined salt extracted from the brine of this largest inland saltwater lake in Asia. Most tractors are owned by illegal salt mining units that have mushroomed in the past decade. Unrestrained salt production threatens the very existence of Sambhar Lake, which was declared a wetland of international importance in 1990 by the Ramsar Secretariat for being a unique migratory bird habitat and wetland ecosystem, says Naresh Kadyan, founder and chairperson of People For Animals in Haryana, a conservation organisation. Kadyan is also representative of UN affiliated Organizzazione Internazionale Protezione Animali or OIPA, an international organisation for animal protection. In March this year, Kadyan filed a public interest petition in the Supreme Court to save the lake. Presence of salt-tolerant algae makes the lake one of the most important wintering areas for flamingos in country, after the Rann of Kachchh. Both Phoniconaias minor and Phoenicopterus roseus, settle here during winters. But their number has fallen drastically in the past two decades because of overextraction of subsurface brine from the lake and pollution caused by illegal salt-making units. In 1982-83, there were 500,000 flamingoes; their number fell to 20,000 in 2008. Now there may be just a few hundred, says Kadyan. In the petition, Kadyan has accused salt manufacturers of digging unauthorised bore wells around the lake and laying pipelines that sometimes extend several kilometres into the lake. Overextraction of groundwater in and around the lake is forcing farmers to opt out of agrarian activities. Many are moving to the business of salt-making, the petition states. An estimate by Sambhar Salt Limited (SSL), a joint venture between Hindustan Salts Limited and the state government, states that more than 2,000 illegal bore wells operate here. “If this goes on, the vacuum created in the lake bed could make it prone to localised seismic activity, which can push the lake bed deeper,” says estate manager M K Cotia. Kadyan’s petition seeks directions to the state government and the Central Groundwater Board to remove the illegal borewells and salt units from the lake area. Following directions from the Supreme Court, Kadyan had also filed a writ before the Jaipur Bench of the Rajasthan High Court, which on April 16 served notices to the district magistrates of Ajmer, Nagaur and Jaipur. These districts border the lake. On April 24, the state government formed a fasttrack committee to identify issues that ail the lake. The committee is headed by the state secretary for environment and forests, secretary for water resources and secretary for industries. On April 29, the Supreme Court asked the Rajasthan government to submit an action taken report by July. 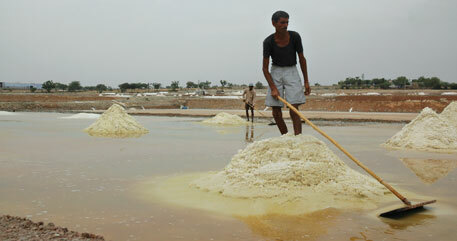 Salt production in Sambhar Lake goes back to over a millennium. Over the centuries, control of salt production passed from local communities to the Rajputs, the Mughals, the British and finally to the SSL. 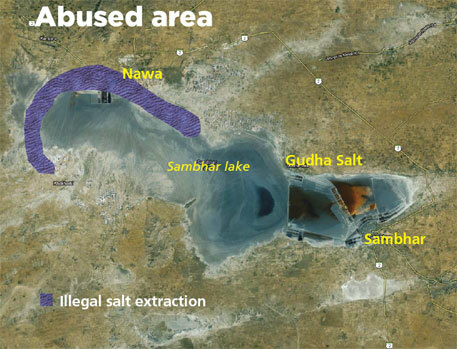 Spread over 1,518 hectares (6,000 bighas) across the districts of Nagaur, Ajmer and Sikar, the lake produces 210,000 tonnes of salt each year, placing Rajasthan among the top three salt-producing states in the country. Over the decades, salt extraction in the lake has undergone a transformation. The traditional process is monsoon-dependent. The lake taps water from seasonal rivers Mendha, Rupangarh, Kharian and Khandel, and numerous streams and rivulets. This water reacts with the lake sediments and becomes brine. It evaporates over 50 days leaving behind crystallised salt. Today, most salt production units use deep bore wells to extract groundwater, reducing the entire process to barely two weeks. 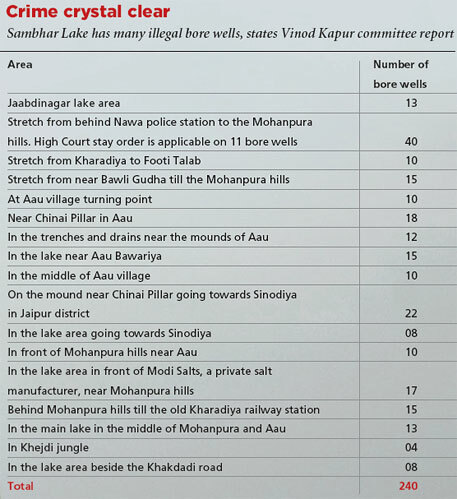 A fact-finding committee set up by the state government and headed by bureaucrat Vinod Kapur stated in its report in 2010 that 15-20 bore wells operate in every bigha (see table on facing page). Excess water extraction has lowered groundwater levels by almost 60 metres in the area. Deprived of recharge from subsurface flows, the lake is shrinking. Rivers, blocked by dams and smaller anicuts, or check dams, to ensure availability of irrigation water, barely contribute to the lake. In addition, salt production units have started hiring tankers to create brine. The tankers plunder groundwater from areas farther away. Villages on the eastern side of the lake face acute drinking water shortage, forcing migration. “There is no control over unsustainable groundwater extraction and the regulatory authorities remain mere paper tigers,” says Kapur. Government intiatives in the past to conserve the lake have failed. In 2010, the state department of environment and forests banned salt production on the Jaipur side of the lake for a stretch of 38 kilometres. However, the ban could not be imposed on the Nagaur and Ajmer sides because their district collectors said it would render thousands of salt workers jobless and dent the local economy. The Central Ground Water Board had declared 35 km stretching across the two districts as dark zone. No action, however, was taken. Overextraction is most likely to spell doom for the workers, say SSL officials. “We experienced good monsoon in the last two years because of which water is available in the lake. What will the salt manufacturers do when monsoon arrives late or when there is a drought-like situation? They will not think twice before rendering the workers jobless,” says Rajeev Agnihotri, general manager (marketing), SSL. The company limits its production capacity to 300,000 tonnes a year. Overextraction is the result of the state government’s lenient land conversion policy. SSL was created in 1960 following a royalty dispute between the state government and the Centre. To produce salt, SSL was alotted 1,675 ha in and around the lake on lease for 99 years. This land mostly belonged to farmers and jagirdars. The jagirdars were compensated with 185 ha, who sold off most of the land to salt manufacturers. Between 1996 and 1998, there was accute drought in the region. Because of the state government’s easy land conversion policy, farmers turned 1,212 ha of agricultural land for salt production. Kadyan’s petition states that the land conversion itself is illegal. Since the lake area has been allotted to SSL, it must first be identified as reserve area for salt production in which no alottment can be made and then state government should notify it, the petition states. Meanwhile, salt manufacturers use all tricks in the book to maximise profits. A team led by the Salt Commissioner and comprising Nawa tehsil officials found submersible pump sets in bore wells deep inside the lake bed. 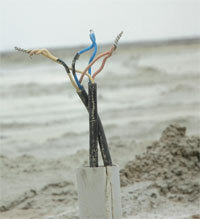 Thin wires connect the pump sets to electricity connections of farmers who live near the lake, says Cotia. There is no monitoring of salt refineries either. “Salt lacking in iodine is supplied mostly to adivasi areas in Jharkhand, Madhya Pradesh and Bihar,” says Agnihotri. Monitoring of the illegal activities is difficult, say Nagaur district officials. This is because of the absence of a revenue map for the areas in and around the lake. But when the Kapur committee report identified 260 illegal bore wells in Nawa and several adjoining areas, some of them were close to the Salt Commissioner’s office and even near the police check post at Nawa. The Supreme Court’s directive to submit an action taken report by July seems to have had no affect on the state government. It has not even started identifying the areas that are under illegal mining. “The area can be promoted as an important ecological tourist spot and the state government can earn handsome revenue from it. At the same time it can allow salt production from the brine area in a sustainable manner since the area has a history of sustainable salt production,” says Agnihotri. Sambhar Salts Limited (SSL) contributes only 3 per cent to the total production in India. But it is high on demand because of presence of sodium chloride in its brine, says estate manager M K Cotia. “The salt pans in coastal areas are usually acidic, while we have alkaline composition, which is good for health,” says Rajiv Agnihotri, general manager of SSL. The government-owned company is planning to promote health tourism around the lake. “For this we signed a memorandum of understanding with India Tourist Development Corporation (ITDC) on December 15, 2012,” he says. SSL has sought expertise from German multinational, Gesellschaft für Internationale Zusammenarbeit (GIZ) on promoting health tourism in the lake. “German salt pans are not used for salt production anymore. Most of the salt production happens through desalination of sea water. Mud from the ancient salt pans in Germany is used by patients affected by various skin ailments,” says Agnihotri. The MoU will give ITDC the rights to use the land, he adds. The Sambhar Lake authorities have 23,310 hectares on a 99-year lease from the government of Rajasthan in Sambhar, Nawa and Gudha areas, which include approximately 15,540 hectares of Sambhar Lake. SSL officials say that soon production from the salt pans could be a thing of the past, as companies such as Tata Salt are already using desalination plants to manufacture salt using imported vacuum technology. “Ecological awareness is what we are aiming at through the tourism project. A check on the illegal extraction of salt would help us expand the project, while salt will be mined in a sustainable manner as it used to be,” an SSL official added.